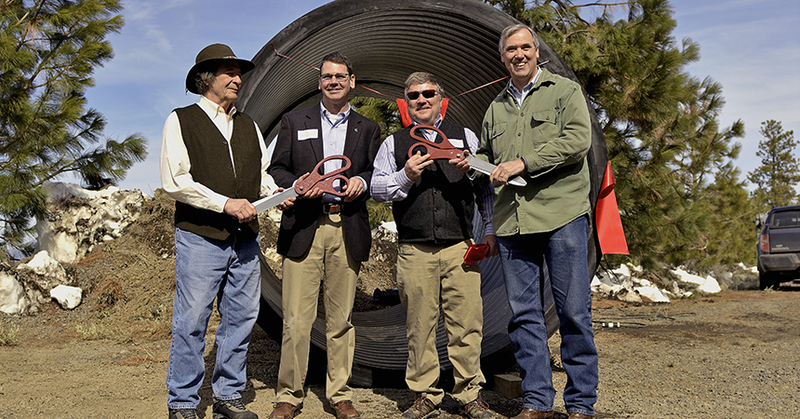 Left to right: Ron Cochran, chair, Tumalo Irrigation District; Matthew Lohr, director, Natural Resources Conservation Service; Ken Rieck, manager, Tumalo Irrigation District; Jeff Merkley, United States Senator. Two irrigation districts, Tumalo and Three Sisters, celebrated major milestones for their innovative irrigation modernization projects today at an event in their honor. U.S. Senator Jeff Merkley, U.S. Department of Agriculture (USDA) National Resources and Conservation Service (NRCS) Chief Matt Lohr and other state and local dignitaries joined the districts at a ribbon-cutting ceremony and tour at Three Sisters’ new Watson Micro Hydro demonstration project, and celebrated the ribbon-cutting of Tumalo’s new irrigation modernization project. Many irrigation districts in Oregon operate aging open canal systems, some more than a century old. With these traditional irrigation systems, more than 50 percent of water can be lost to evaporation and seepage. But projects like Tumalo and Three Sisters are starting to change that. Farmers Conservation Alliance, with support from Energy Trust of Oregon, developed the Irrigation Modernization Program in 2015 to help rural communities address aging infrastructure and position themselves for long-term sustainability by installing closed-pipe, small-scale hydropower generation systems to replace open irrigation systems. Upgrading these systems is complex and expensive, but the program has received widespread support, thanks to a unique public/private partnership that brought funding from 15 different federal and state organizations totaling almost $50 million so far. With help from Senator Jeff Merkley, Tumalo recently received up to $30 million in federal funding from NRCS toward replacing 69 miles of open canals to benefit over 670 farms and ranches. Meanwhile, Three Sisters Irrigation District has already modernized 92 percent of its irrigation system, piping 59 of the district’s 64 miles of canals and are on their way to finish next year. The near-completion of the irrigation piping system also provides multiple hydroelectric power opportunities. The Watson Micro Hydro demonstration project is the most recent, and a critical new phase for their work. When it’s fully operational, the facility will generate nearly 5 million kilowatt hours of clean energy and provide a long-term revenue source for the district. Energy Trust was honored to support this project and provided an incentive of $400,000 for the renewable energy generation it achieved. Tumalo and Three Sisters are just two of more than 20 irrigation districts around Oregon in various stages of assessing the results they could achieve by modernizing their water delivery systems. With its collaborative approach, the Irrigation Modernization Program accelerates the upgrade process, allowing faster access to these benefits and providing a model for the future of irrigation in rural communities nationwide.